The power of authority websites and transfer it to yours. You will receive a total of 60 edu backlinks (45 profiles & 15 wiki properties, all unique edu links) that will be reinforced with 500 wiki links (awesome!). This gig is a highly authority SEO service and I will help improve your website rankings! Make sure that you follow all the instructions provided after ordering. Feel free to contact me! Quality edu backlinks! 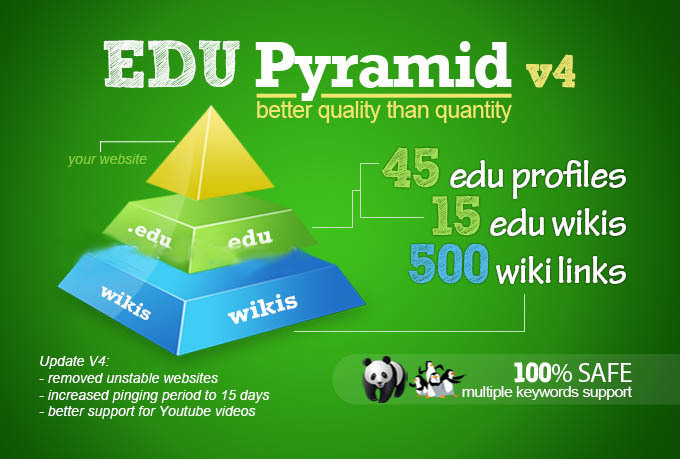 create a super edu pyramid with 60 edu backlinks and 500 wikis is ranked 5 out of 5. Based on 12 user reviews.